Ian Hamilton Finlay (d. 2006) was a British artist active in the second half of the last century, who exercised enormous influence on other artists of his own and subsequent generations. His work encompasses a variety of different media and discourses. Poetry, philosophy, history, gardening and landscape design are among the genres of expression through which his work moves, and his activities have assumed concrete form in cards, books, prints, inscribed stone, wood sculptures, room installations and fully realised garden environments. With the collaboration of the artists’ estate, a ‘detached sentence’ by this artist-poet who loved the sea will be written on the Harbour Arm Lighthouse. It has been taken from Ian Hamilton Finlay's published writings, and this is the first time it has been realised as an artwork. 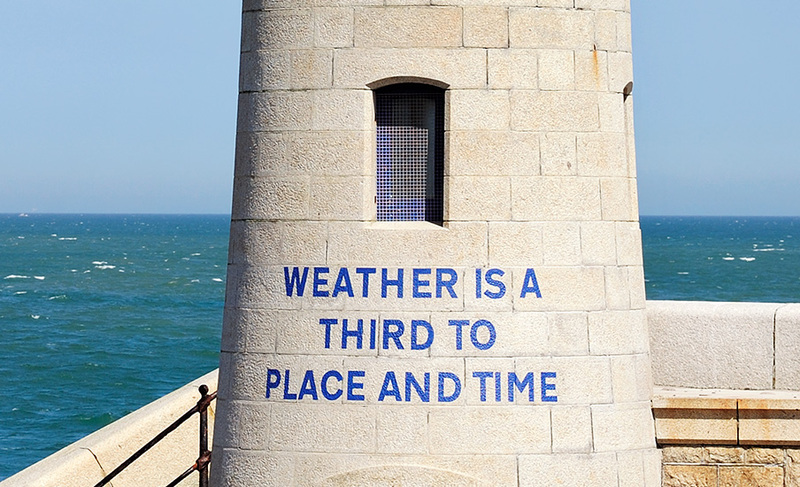 'Weather is a Third to Place and Time' is a practical reminder of how important the weather is to all who work at sea. It also suggests how the weather – onto which we tend to project our moods – colours in and gives meaning to the two dimensions of our normal self-awareness: place and time. The lighthouse is situated about 10 minutes walk from the foreshore, but to view the artwork it is only necessary to walk about 5 minutes, through the derelict Harbour Station, from where visitors are invited to climb onto the top walkway of the Harbour Arm. Here they will find a viewing platform, or lookout, with a telescope, enabling them to see not only Ian Hamilton Finlay's text on the Lighthouse, but many of the other artworks in the exhibition as well.